On January 3, 1966 the legendary Psychedelic Shop on Haight Street opened its doors. It was likely the first, but no one was keeping track. In other words, the drug of choice, usually an illegal one, was the prefix for the word “head” until the word alone referred to a drug user. In the 1960, the most common drug was marijuana, of course, so a “head” commonly referred to that person and that drug. While that use of the word may have been an underground one, entrepreneurs would still shy away from using that specific a word to name their establishment. Head shops were not simply a supply store. They were places where so-called underground news was found whether it be in newspapers, flyers, or political conversation. What were a head shop’s supplies? Black lights for posters that used inks containing phosphors. When the ultraviolet light hit those inks the posters glowed. A nice enhancement to an evening atmosphere in a dorm room or a basement rec room. The pill case, but not the pills, The grass container, but not the grass. Candles and incense. The Beatles influence went beyond music, of course, and their delving into Eastern philosophy meant those things associated with the East were automatically interesting. When tie-dyed clothing became popular, it joined the scene along with other “hip” clothing along side water buffalo sandals. Not that a head shop sold the drugs themselves (at least not directly), but the shop sold those things necessary for drug use. 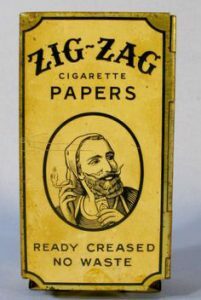 Rolling papers (Zig Zag? Big Bambu? ), hash pipes, and water pipes (for those harsher cheaper blends that were the only mixes sometimes available or adding a bit of mentholated mouth wash to the water for a cooler drag). Google “on line head shop” and not surprisingly one will discover that that they are there in full. “Smoke Cartel,” “Dankstop,” “Everyonedoesit,” “Smokesmith Gear“, and many others offer both the new necessities (vapes) and the old school standbys. As always, the more things change, the more they stay the same.